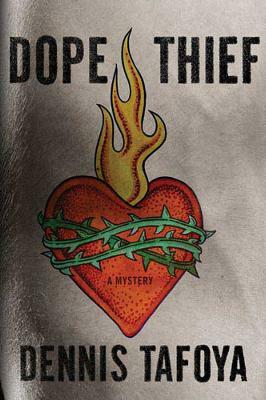 Dope Thief by Dennis Tafoya is about a couple of guys who rob dope dealers for a living, and have to go on the run from some dangerous characters after they mistakenly pick up a big stash of organized crime loot. I mean, yeah, that’s the basic plot. But the book is really about how our past has a way of haunting us at every turn, and our attempts to escape from that. It’s also about the question of whether we can shed our family history. And whether — for all the emotional baggage and misery it can bring us — we’d really want to. The protagonist, Ray, and his partner are a couple of bottom feeders in a criminal community extending into Southeastern Pennsylvania and South Jersey. They make their living disguising themselves as DEA agents, ripping off small-time drug dealers, and making off with their money and dope. In a clever twist, they’re able to get away with it because they provide a kind of service to the larger operations — getting rid of small-time dealers who might eat into profits. Yet Ray isn’t a violent man. Or a bad guy, for that matter. He had an alcoholic father and a troubled youth that included some jail time. He just kind of went along with where his life was taking him, much the way another young man might go the college-and-career route without even considering other options. For him, the whole theft operation represents the path of least resistance — a chance to get money for a minimum of effort. But he’s not getting any younger, and knows he can’t keep it up forever. Inevitably, that wake-up call comes when a job goes bad, people get killed, and he and his partner end up the unwilling possessors of some New England bikers’ money. It starts out in pure thriller territory. An initial car chase from the scene of the original botched operation is particularly suspenseful. From there, the story takes some unexpected directions. And I’m not talking about plot twists — though there are a few of those — so much as emphasis and pacing. Tafoya doesn’t let up on the suspense. But for stretches, the central plot fades into the background as Ray comes to grips with the chain of circumstances that led him into this predicament. Sure, he knows he’s made some bad decisions. But he finds himself facing the question of whether his life experiences left him equipped to make any better ones. More importantly, does he have it within himself to rise above those experiences and decisions, and make something better of his life? Tafoya addresses those questions in a surprising extended coda, where minor characters and circumstances that would merely serve as color in another crime thriller turn out to be vitally important. Crime thrillers often get criticized for piling on the slam-bang action, at the expense of characterization and deeper insights. With Dope Thief, fortunately, it’s not an either/or proposition.